College basketball fans all over the country are in a basketball frenzy. Making plans to go see their teams chase the dream, filling out their brackets and planning their excuse for missing work this week. It really is March Madness. But along with this Madness there are many special moments made. We’ve all seen these moments and even been a part of them. It’s the occasion where real life becomes a part of the game. We all love to see our favorite team win but nothing is more compelling than to see some of these real life dramas play out during the NCAA Tournament. Moments when folks overcome real life adversity, moments of great personal triumph, moments that bring people together and moments that bring people real joy. If you aren’t a Louisville Basketball fan chances are that you will forget who the 2013 National Champion was. But there isn’t a college basketball fan that will forget how that team rallied around one of their fallen brothers. The moment when they lowered the basket to let Kevin Ware cut that net folks all over the country were cutting it with him. And as a fan how great was it to see Tim Henderson hit those three point shots. What a moment for that young man. And I’ll never forget how happy I was for Luke Hancock getting to play the best basketball of his life in front of his ailing father. And there wasn’t a father among us who couldn’t relate to the pride Mr. Siva had cheering for his son and how he had overcome his own adversity through his son’s faith. We all felt great joy in watching that team win a championship. On Friday I’m looking forward to heading to Indianapolis for a college basketball smorgasbord. I’m going to watch four basketball games that will feature three different basketball teams from Kentucky. 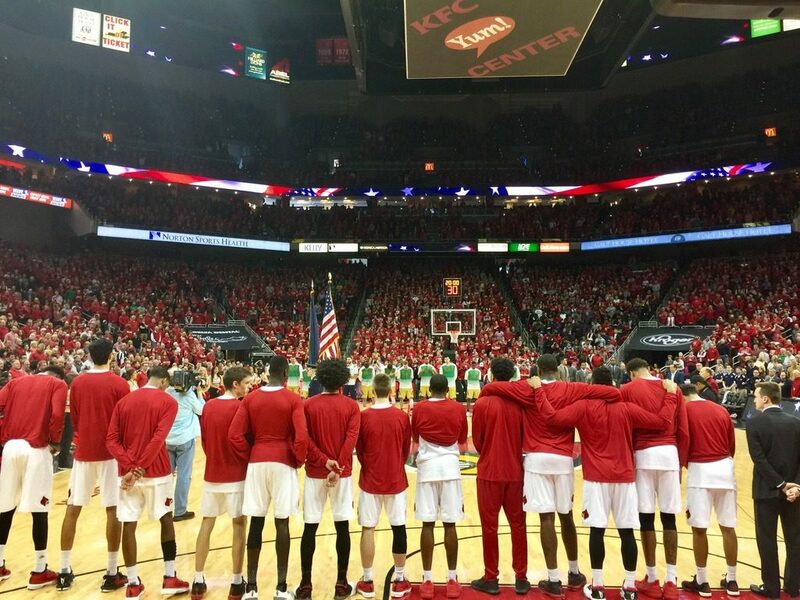 I’m also looking forward to that moment that Moment when my Cardinals make their return to the NCAA Tournament again after a post season ban and that moment when Kentucky’s Mr. Basketball NKU’s Carson Williams takes the NCAA Tourney floor for the first time. Carson is only the second player from my humble hometown of Owenton Kentucky to play in the Big Dance. That entire community and everyone from there have followed this young man’s journey. Friday will be a culmination of the pride we all have for him. There is going to be a lot of great basketball played over the next three weeks. And there are going to be many more special moments made. Don’t get all caught up in the wins and losses of it all and miss out on some of the real life inspiration that can come from it. Don’t miss the “Feel Good” of it all. I wish each of you a great March Madness. Enjoy it! Go Cards! This entry was posted in THE BEAK DAILY by ru4uofl. Bookmark the permalink.